Information is the lifeblood of financial markets. Access to superior information faster is one of the defining factors of successful wealth managers globally, and “news” whether in print, digital, traditional, or social, is the conduit by which information makes its way to the marketplace1. In this article we explore the history and differences between social media and premium editorial media, and their differential effects on asset prices. Which is right for your business? In the finance literature, there have been a large number of natural experiments suggesting the importance of organised news gathering operations. Peter Koudijs of Stanford’s Graduate School of Business explores the disruption of news-carrying shipping routes between England and Amsterdam in the 18th Century. During this time, variations in weather patterns were frequently able to prevent the timely arrival of news for up to several days. Using this unique historical situation, Koudijs is able to isolate return volatility attributable to the arrival of news regarding English stocks traded on the Amsterdam exchange. The result? 25-50% of return volatility could be explained by just the organized packets from English news outlets and scouting services2. Given the significance of local economic conditions, market conditions, regulatory frameworks, and expectations of frictions, it is clear that the news channel plays a critical role. Even as far back as 1630’s France, the organized “bureau d’adresse et de rencontre” in Paris acted as a hub of information sharing on a myriad of topics. Its architect, Theophraste Renaudot, is also the founder of France’s first weekly newspaper, La Gazette. The point of creating information sharing hubs was to surface the information critical to making better decisions in society and connecting people. These facts alone are not surprising--the more effort is spent curating data, the better the information and knowledge that may be derived. Modern news bureaus are large and sophisticated global networks of information gathering and release. Outlets like Dow Jones, Bloomberg, Reuters, and the Financial Times regularly benchmark their coverage and market impact to ensure information is timely and relevant. The proportion of breaking stories across the big players on any given day can range from ~5% of news coverage to ~20%. The advent of globally connected information networks such as the internet, coupled with a dramatic decrease in computing cost over the past decades, has created an enormous opportunity to collect and publish data on everything from weather stations to the emotional status of a neighbour’s dog. For financial market participants, the maturing “alternative data” universe offers a staggering variety of data sets describing individuals, organisations, markets, and indirect attributes (e.g. satellite imagery, speech pattern analysis, scientific knowledge tracking) which can help predict changes in strategy, capital allocation, and more. Perhaps the single alternative data source that has received the most attention is “social media” or peer publishing, which allows individuals to distribute content freely and publicly to an enormous number of subscribers (336M for Twitter alone at the last count)3. By and large, channels such as Facebook, Twitter, Instagram, and Snapchat (among others) facilitate the sharing of fleeting social content. However, Twitter and Facebook in particular have also become social news ecosystems in their own right4. Facebook for consumption, Twitter for distribution. Twitter’s open publication model has effectively moved the ambient noise of social discussion into a digitized database of streams of consciousness5. From a financial markets perspective, a minuscule proportion of messages shared on Twitter have any relevant informational content. The majority of these represent duplicate or stale news stories6 that decrease investors’ ability to focus and react appropriately to the full information set available. Looking at the same set of days for AT&T on Twitter, the picture is rather bleak. 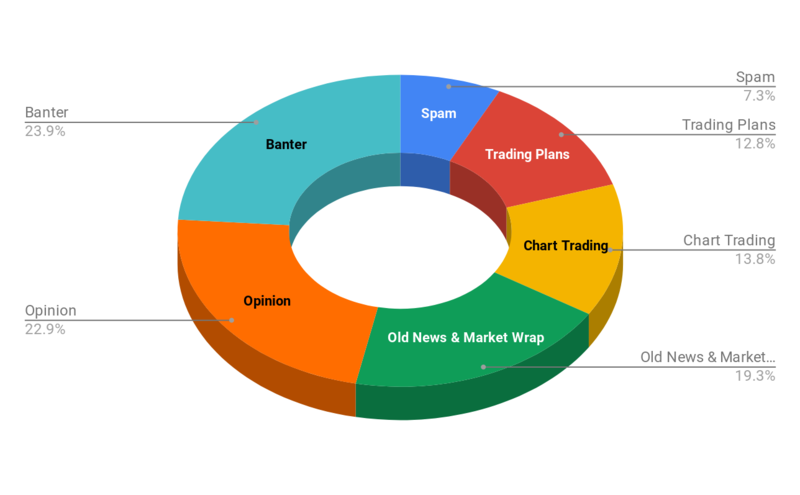 Of an average of ~120 messages each day that mention the AT&T stock ticker directly, more than one third of messages are mentions of profits from options trading, or technical chart trading alerts. Another third represents spam or banter among subcommunities, and the remainder appear to be news stories re-published from highly questionable web-only content channels. Removing Twitter’s filters, and capturing all conversations mentioning AT&T and its brands expands the universe to about a thousand messages per day, but most of these messages relate to sports events, TV shows, and service quality, rather than revealing differential information about business fundamentals, or breaking news. Taking a more quantitative approach to the analysis of web-scale social media data does have uses, and those uses may dovetail indirectly with financial variables of interest. For instance, social media does, as the image above suggests, provide live insights into retail customers’ opinions of products and brands. For the retail sector, this kind of data can be used to track consumer sentiment, which may be useful for predicting certain operational variables that contribute to the formation of asset prices. However, even in this case it should be noted that the population of product advocates and critics who take to social media is a biased sample of the population and tends to be a very small draw from the whole set of consumers8. Insights from these channels are noisy at best. In future articles we will expand on how Machine Learning (and Natural Language Processing in particular) can help you to mine insights from large noisy data sets. In this case, the data sets are neither “big” nor informative for the largest companies, let alone the tail of US Equities. This all boils down to a simple yet powerful insight: The puddle of available information does not grow linearly with the ocean of available data, but the complexity of extraction may grow exponentially. Although there are regular instances where social media appears to contain gems of insights ahead of the curve, they tend to be particular in nature and difficult to identify in a timely fashion. There is no strong empirical evidence to support the notion that the introduction of social media has drastically expanded the amount of information available in financial markets, although it has increased the available noise9. Dataminr, among the more sophisticated sources of social media streams and analytics, provides a select set of examples of surfaced messages they claim show the value of their platform to financial clients. Primary among them is a case study from 2016 at the time of the Brexit vote in the UK10. Dataminr shows a set of unattributed tweets an hour before the vote confirmation (which occurred out of market hours), indicating rumours of a “Leave” win in Sunderland. What Dataminr does not show is that at the same time there were almost equal numbers of rumours available on Twitter for either side of the debate, and that the particular strategically unattributed pivotal rumours were actually posted from BBC accounts—the most mainstream source of editorial content. In summary: Whereas studies continue to document economically significant effects of editorial news on asset prices over the short and medium term, empirical and anecdotal evidence on social media has as yet not been able to sort the signal from the noise. The recommendation? Ensure you are leveraging the reliability, novelty, and value of editorial news before investing heavily in the hype around social sources, unless it makes particular sense for your universe of companies and markets. About the author: James Hodson is a researcher, entrepreneur, and social activist. His work spans Machine Learning, Economics, Sustainable Global Development, Sociology, and Philosophy. James currently serves as CEO of the AI for Good Foundation; as Senior Researcher at the Artificial Intelligence Department of the Jozef Stefan Institute, Slovenia; and as Chief Science Officer of Cognism, an AI-powered Financial, Human Resources, Sales, and Marketing intelligence platform. Through these roles, James seeks to effect lasting change in our economies, societies, and scientific understanding. He is an early stage investor in technology-focussed start-ups, nurturing leadership, teams, energy, and innovation. Previously, James built and directed the AI research group at Bloomberg in New York, a 20+ research focussed group across Machine Learning, Natural Language Processing, Knowledge Engineering, Reasoning, and Inference. He was a researcher at the German National Research Laboratory for Artificial Intelligence (DFKI) and holds patents across Machine Translation and Network Inference. Twitter Earnings Call Investor Presentation, Q1, 2018. Almost half of adult Americans use Facebook as their main source of “news”, according to a Pew Research Center study: http://www.journalism.org/2016/05/26/news-use-across-social-media-platforms-2016/. Teresa Correa, Amber Willard Hinsley, Homero Gil de Zúñiga, Who interacts on the Web? : The intersection of users’ personality and social media use, Computers in Human Behavior, Volume 26, Issue 2, 2010, Pages 247-253, ISSN 0747-5632, https://doi.org/10.1016/j.chb.2009.09.003.